At the lush Isparta Valley in Turkey is where the precious Rose Damascene thrives. Every June, the farmers harvest the first blooms using a generations- old sustainable farming method and just before the season ends, 2500 tons of Rose petals were already harvested and transported to a distillery for extraction-the result is the essence of the Rose Damascene: Pure, gentle, and uncomplicated--this is what goes into every bottle of PureDKNY A Drop of Rose. PureDKNY A Drop of Rose is primarily made with the Turkish Rose and has touches of Magnolia, Blackcurrant, Verbena, Cedar, and Vanilla. 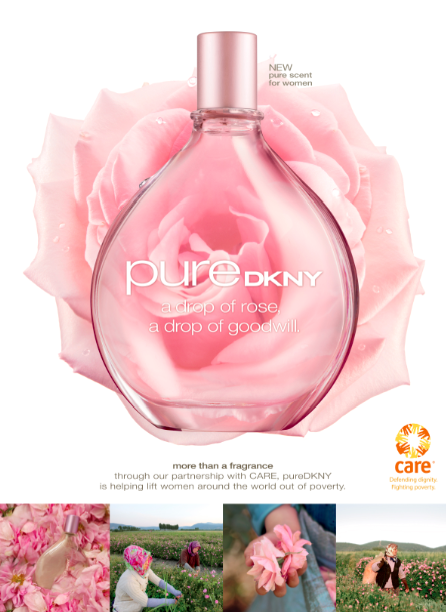 Apart from its overall pure scent, this fragrance also has the purest of intentions: Through this fragrance, DKNY is able to assist CARE, a leading humanitarian organization that aims to bring people out of poverty, and they also promote livelihood amongst Turkish farmers (which are mostly women) by purchasing the Rose petals from them. Not only that, every component of this fragrance is made from recycled, almost-chemical-free, and biodegradable materials--Even the ink used on the carton was eco-friendly! Sounds very romantic and luxurious ano mas mabango ito o un be dekicious intense pink? the bottle looks so feminine and powerful. The only flower scent that I really like is rose so this really is interesting. Thank you for sharing Martha! Wow your description is mesmerizing Ms. M! I haven't had any rose-based fragrance but I have rose-scented bath gels. Kudos to sustainable livelihood and farming and a big Hurray to eco-friendliness. i really love how well you review a perfume =) parang feeling ko at naiimagine ko yung scent.. for me, PERFUME REVIEWS ang pinakamahirap kasi very poor ang pagdedescribe ko ng mga pabango, bad thing pa na i think i have allergy on strong scents.. =( kaya siguro hanggang cologne lang ako..
Ito yung nipost mo just today na may advocacy :) Very nice post "Shopping Saves the World"